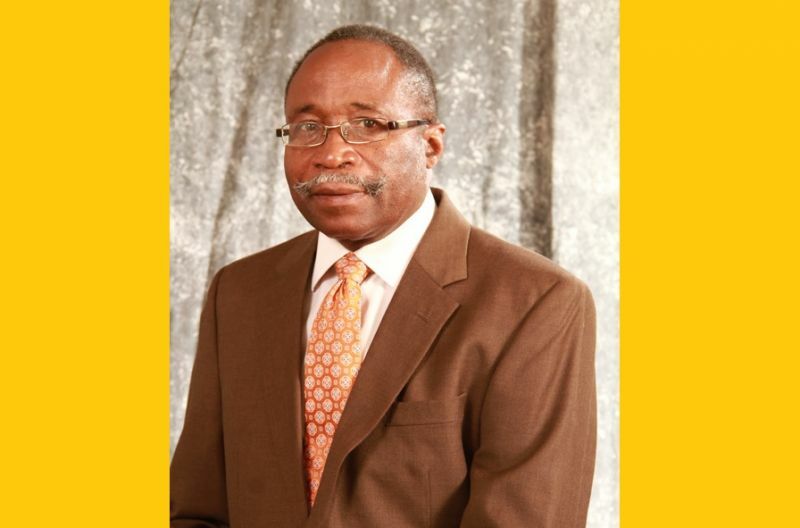 ROAD TOWN, Tortola, VI- A day after telling this news site that he would not comment on internal party issues when he was asked about the alleged attempts to have him replaced as Leader of the Opposition, Hon Julian Fraser RA (R3) has now broken his silence on the ongoing saga, which has already split the Virgin Islands Party (VIP). 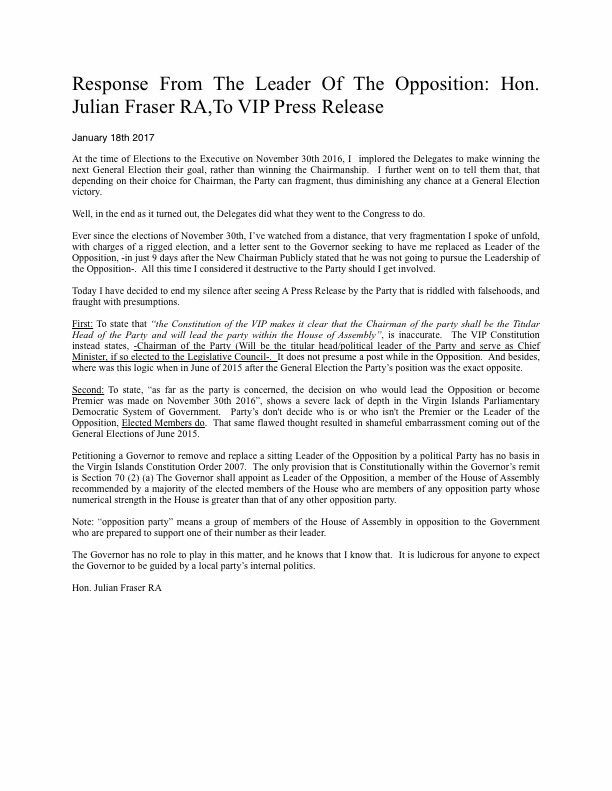 It was yesterday, January 17, 2017 that this news site first and accurately reported that Virgin Islands Party Chairman Hon Andrew A. Fahie (R1) had a renewed interest in becoming Leader of the Opposition, even after Governor John S. Duncan OBE had chosen Hon Fraser for the post following the 2015 General Elections. 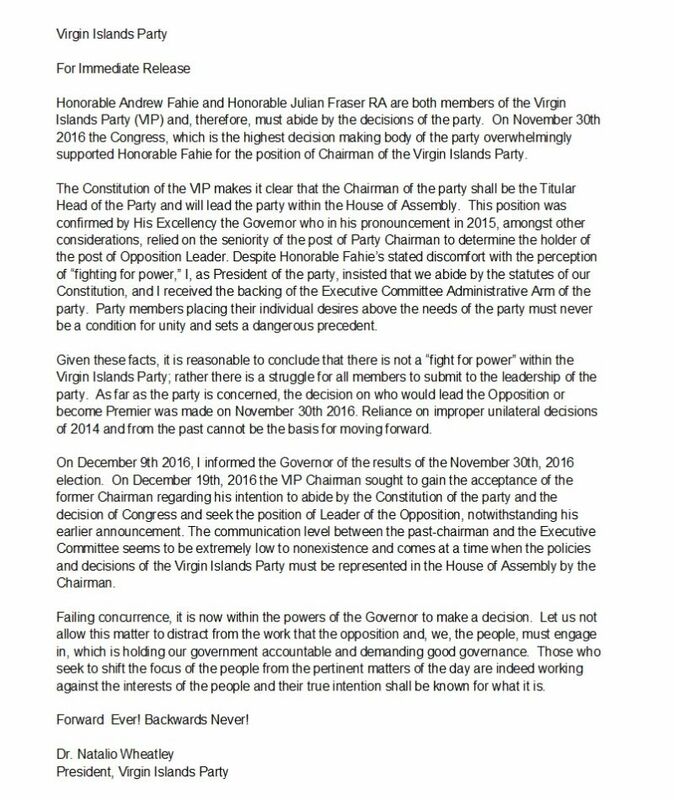 Following our story, the Virgin Islands Party, through its President Dr Natalio D. Wheatley aka Sowande Uhuru, responded with a letter to the media, in which he stated that the Virgin Islands Party at its Executive Members elections in November 2016 had voted for a new Opposition Leader when they elected Hon Fahie as the new Chairman. 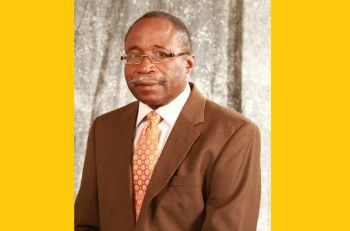 Dr Wheatley, in his statement, said the Constitution of the VIP makes it clear that the Chairman of the party shall be the Titular Head of the Party and will lead the Party within the House of Assembly. “This position was confirmed by His Excellency the Governor who in his pronouncement in 2015, amongst other considerations, relied on the seniority of the post of Party Chairman to determine the holder of the post of Opposition Leader. Despite Honorable Fahie’s stated discomfort with the perception of “fighting for power,” I, as President of the party, insisted that we abide by the statutes of our Constitution, and I received the backing of the Executive Committee Administrative Arm of the party. Party members placing their individual desires above the needs of the party must never be a condition for [dis]unity and sets a dangerous precedent,” Mr Wheatley added. 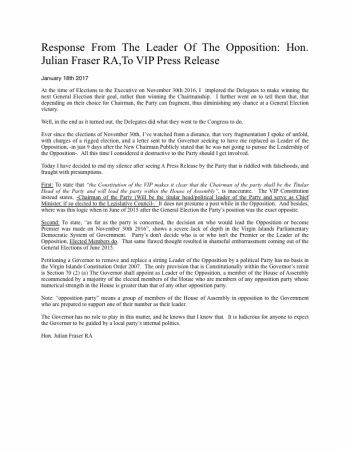 Hon Fraser, in his statement to the press today, January 18, 2017 said he decided to end his silence after seeing a press release by the VIP that was riddled with falsehoods and fraught with presumptions. 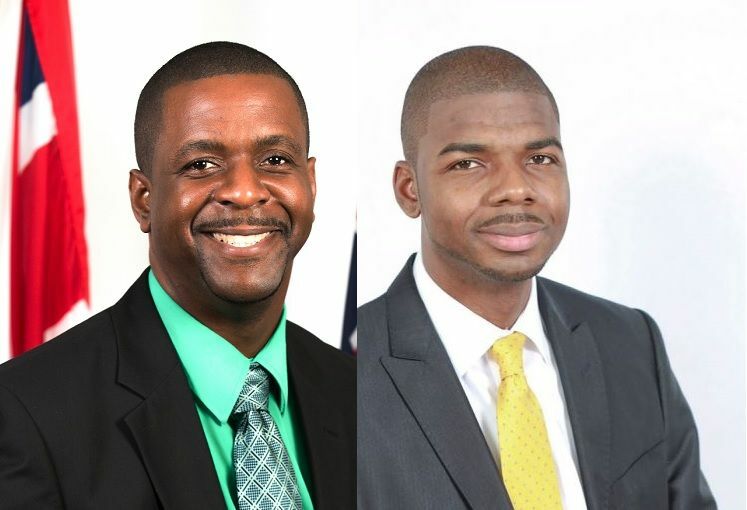 “Second: To state, “as far as the party is concerned, the decision on who would lead the Opposition or become Premier was made on November 30th 2016”, shows a severe lack of depth in the Virgin Islands Parliamentary Democracy. A Party does not decide who is or who isn't the Premier or the Leader of the Opposition, Elected Members do. That same flawed thought resulted in shameful embarrassment coming out of the General Elections of June 2015,” Hon Fraser stated. Meanwhile, it was reported by this news site that Hon Fahie has made his intentions to become Opposition Leader known to Governor John S. Duncan OBE as well as Hon Fraser. 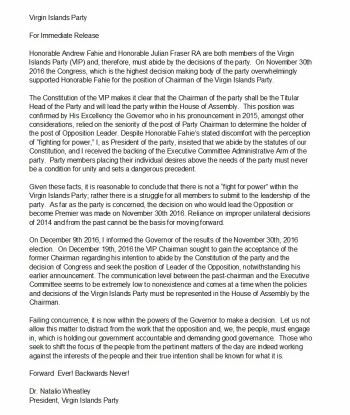 But according to Hon Fraser, petitioning a Governor to remove and replace a sitting Leader of the Opposition by a political party has no basis in the Virgin Islands Constitution Order 2007. The Opposition Leader also made it known that he had warned delegates at the time of Elections to the VIP Executive on November 30, 2016, to make winning the next General Election their goal, rather than winning the Chairmanship. The veteran legislator added that ever since the elections of November 30, 2016 he has watched from a distance, that very fragmentation he spoke of unfold, with charges of a rigged election, and a letter sent to the Governor seeking to have him replaced as Leader of the Opposition, in just 9 days after the New Chairman publicly stated that he was not going to pursue the Leadership of the Opposition. These vip rattle snakes still trying to further overthrow fraser? Who? carvin, andrew, maynard ,sharrie, all out, omar, sheep, zoe and the rest of those snakes in the grass????? The real question is, who will fall apart first, VIP or NDP? Even Betito's CCM looking good now. Who knows, perhaps that is where Sowande will end up next. Look what Fahie and Swande has done. Put fuel in Frazer Empty tank. Breathe life into the dying monster.. Now it's more Chaos and confusion... Brainless men.. How can they lead? The art of good leadership demands humility, self-criticism, and a very real and practical love of land and people. but had the patience to wait the remainder of Fraser's appointment before pushing himself around. I was so hopeful that VIP was headed in a good solid and smart direction. No more fighting please! Mr. Governor has to decide and both Fs must be considered based on the merit of each case. Yea first timer come and destroy this thing but the good ppl of the third will fight hard on this one. Lol call him the political grim reaper! Come to cut down what is left of the VIP with is scythe! The guy has the "reverse midas touch" ! Everything political he touches withers and dies! All the two F's have to do is Formed Vip2 and Vip3 because as I can remember Vip1 was laid to rest in May 1995..You cannot raise the dead let this Vip thing go the founding members are long gone Please Please , you too gentle need to create your own identity start you all own party and stop looking like Poppy Show all over the world..It do not look good for two men who say they want to lead the country..I can't see how can you all beat the NFP who is so fragmented with this kind of conduct , these days if you Fart to hard the news pick it up and run with it..
Fuel on Fire. Frazer should have taken the high ground and let it be.. Be the bigger Man... Poor VIP. Them dead now. They keep walking all over him. How much should he allow them to do before he stops them and bring some light to the public. We don't want any more sweet talkers leading government. nor do we want reactionary whiners who is so insecure all he does is complain. That is what got him in the first place. there is no maturity there. It's all about him. I don't care who they bring ,Action Man and Tall Ball Head, going to lim them down again and be careful them who Dea fighting for power wouldn't have no power at all..
We do not learn from the past. We wipe it out. So we are forever beginning anew. I amashamed at what hasbecome of the V.I.P. Where is the intellegence of the two senior members of the party. They have played into the hands of the N.D.P. for humiliation. Who is the Mo Moo's of the week?? F & W they kill the party dead now..
Fraser do not worry about any thing give the opposition to fahie let him see how it is do not stop and let him kill yuo for power you are above that the Lord is looking down and fahie time will come the lord does not like ugly sit still fraser and see what god has for yo you will have to be the same ons to save fahie do not frett up your self you will be around to smile at the calamity. I know you are a good man despite what is being done to you lean on God continue to pray and God will see you throug he shall make you to rise above yoye enimies. Fahie time longer than twine. I am wondering if Fahie needs Fraser to run with him in 3rd District. Foyee, boy if I were Fraser I would retire from VIP and let you run the ship on the reef. I dont see Fraser being a second fiddler. The Leader of Opposition has nothing to do with party chairmanship. The Governor dont have time with this piss. The Constitution stated when the leader is chosen...after elections. It does not make provision for choosing a leader of Opposition each time a party has elections. What will LOO do for Andrew? You mean tis $3,000 addition on the paycheck got Andrew going in this direction? Ah sah. Party dead now. Get rid of the old and in with the new. Lord we need a flood to wipe this island clean.